The purpose of this article is to identify the impact of Lexin Resources' well inventory on the list of Alberta orphan wells, as published by the Orphan Wells Association (OWA) in March 2017. 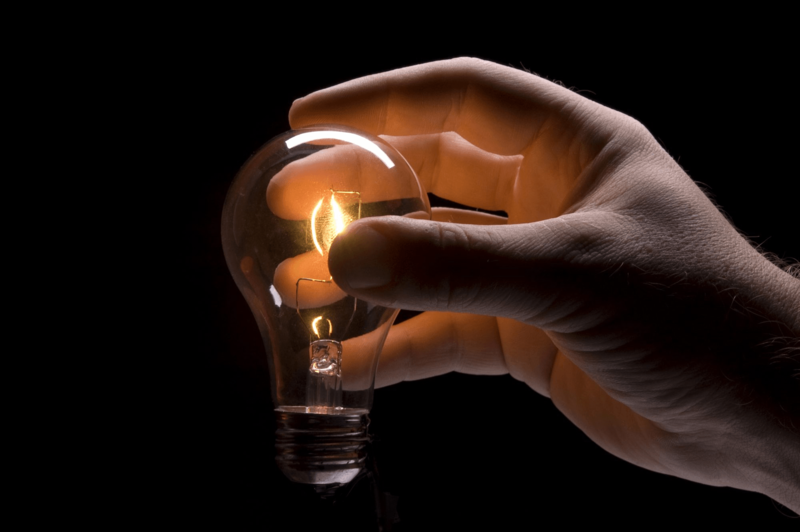 This analysis is prompted by recent articles in the Calgary Herald (up to March 31), which refer to Lexin Resources as being shut down and put into receivership by the Alberta Energy Regulator (AER). This analysis is a snapshot in time and because the number of wells and their status may change over time, this article refers to the counts in the past tense. Please note the disclaimer at the bottom of this post. 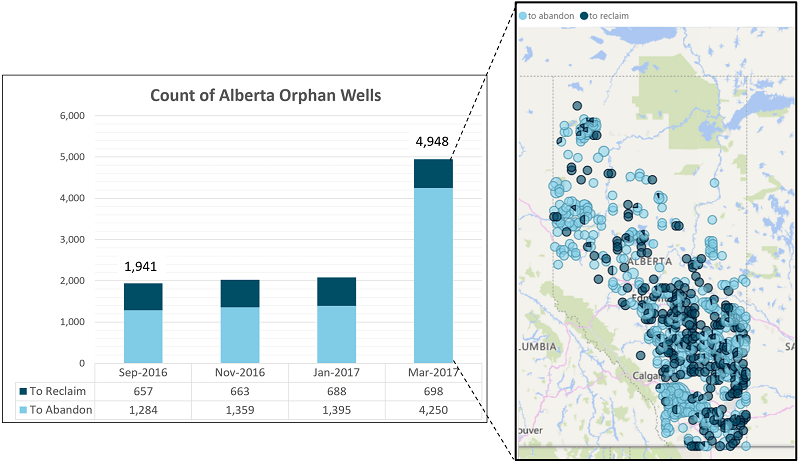 There were 4948 orphan wells in Alberta as of March 2017. Most of those (4250) were classified as having a next step "To Abandon". This means they are to be permanently cut and capped (sealed). The remaining 698 wells were classified as having the next step "To Reclaim". This means the land surrounding the well is to be remediated and reclaimed. 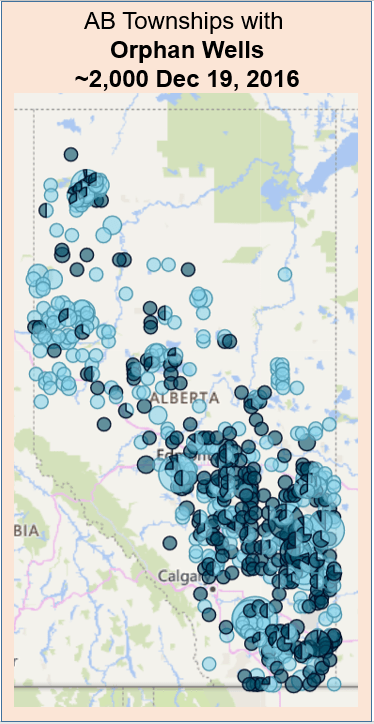 The blue circles on the map above show a broad distribution of orphan wells across Alberta, with pockets of concentration evident. To have a well properly "Abandoned" and "Reclaimed" (in AER parlance) is a good thing; it's like saying the well has been properly decommissioned. The OWA does this work on behalf of the industry when well licensees (companies) become defunct (such as going bankrupt). In other words, the wells have become ownerless and the OWA steps in to guide them through end-of-life. The total number of orphan wells in Alberta increased from 1961 wells in Sep 2016 to 4948 wells in Mar 2017, a 152% increase over that period. The AER stated on March 21 that "care and custody of Lexin’s assets remain with the Orphan Well Association and identified working interest participants." The orange circles on the maps above approximate the location of the wells. This is done by identifying Lexin's wells in each Alberta township and then plotting a circle in the centre of those townships (ie. based on the AB Township Survey). The bigger the circle, the greater the number of Lexin wells in the township. All of Lexin's wells appear to be classified by the OWA as having a next step "To Abandon". The majority of Lexin's wells were located south of Calgary, though there were a few pockets elsewhere in the province. The chart below indicates that Lexin's amount of orphan wells "To Abandon" is significantly more than the next highest, that being 274 wells, once belonging to Canadian Coyote Energy. The Alberta Energy Regulator (AER) has indicated that some of Lexin's wells could eventually be transferred to other operating companies. As in, some of the wells will not remain orphan wells and will take on new owners. *Orphan Wells" are wells associated with Defunct Companies, which "are licensees that are deemed defaulting working interest participants by the AER pursuant to Section 70(2)(b)(iii) of the Oil and Gas Conservation Act." Disclaimer: The graphs and statistics above are intended as factual descriptions, without making any judgments regarding the parties involved. The information is offered as educational material only and is not guaranteed to be accurate. The source of the raw data is the OWA. To see numerous interactive dashboards on the subject, please see this link. 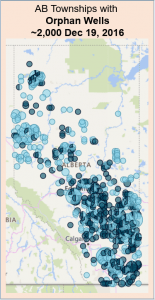 Is the Number of Alberta “Orphan” Wells Growing? 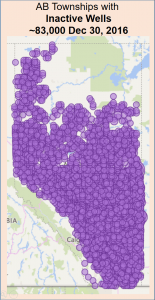 Yes, the number of Alberta “Orphan” Wells has grown by 820 between March 2016 to Feb 8, 2017. Fuzeium has been looking at the “Orphan” Well Lists published periodically by the Orphan Well Association (OWA) and has been tracking the changes over time. From the graph below, one can see the yellow bar starts with 1,467 Orphans to Abandon and to Reclaim, which is then followed by increases and decreases until netting out at 2,287. In quoting the number for Orphan Wells, we recommend using phrases like, “it was about, or it was approximately, 2,200 at the beginning of February 2017. 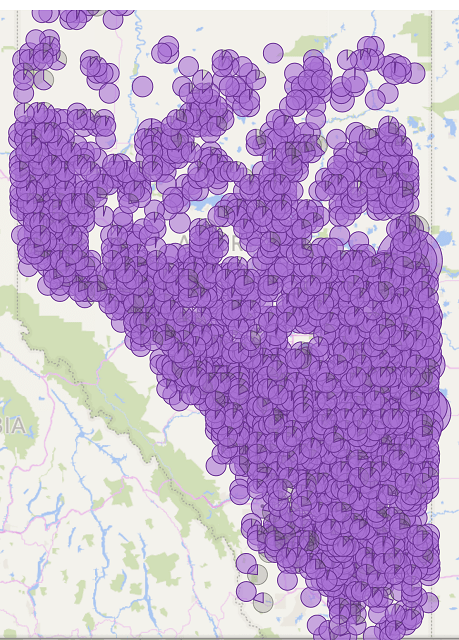 How Many “Inactive” Oil & Gas Wells Does Alberta Have? At the end of 2016, there were about 83,000 wells in Alberta deemed “Inactive”*. 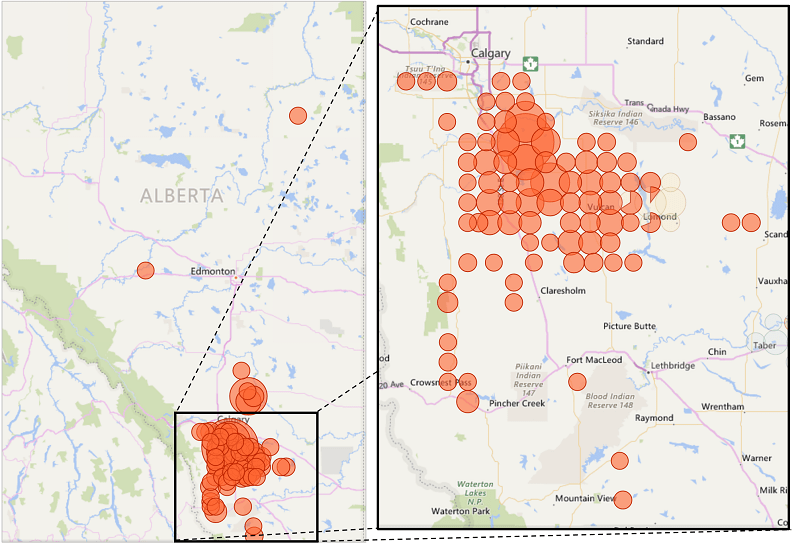 Those wells have been plotted against the Alberta Township System and the mapping shows a dense distribution across the province. In quoting the number for Inactive Wells, we recommend using phrases like, “it was about, or it was approximately, 83,000 at the end of 2016”. An *Inactive Well ” is a well that has not reported an operation (production or injection) to Petrinex in the last” 12 calendar months”; this quote is from AER Directive 006 – Licensee Liability Rating (LLR) Program and Licence Transfer Process. Published February 17, 2016. The original data source related to this post is the: AER Inactive and Forecast Data File for Dec 30, 2016. The file is republished daily. The Inactive Well number changes marginally on a daily basis (as reported by the AER).